Billy Barlow in British Cider Cellars, Taverns, and Music Halls – A Little About Sam Cowell -John Simms Reeves – W G Ross and His Famous Sam Hall – W C West. Benjamin Oliver Conquest – John Lawrence Toole – Some English Low Comedians Who May Have Played Billy Barlow – Toole’s Thoughts on Comedians and Tragedians. 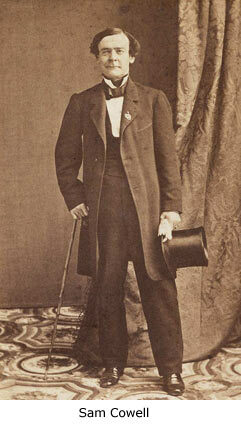 In the years between his birth, sometime before 1829 and the turn of another century, Billy Barlow had his heyday. Never before, and never since, has such a well-defined character appeared in only very slightly modified guises, played by so many different people. Most popular characters die along with the actors who play them, so that they die once. Maybe if several performers played them they might die a dozen or so deaths. Billy Barlow may have died a hundred times. Sam Cowell was born in England, but he was brought up in America from the age of two, and his early influences were the people, black and white, of the pre-Civil-War South. 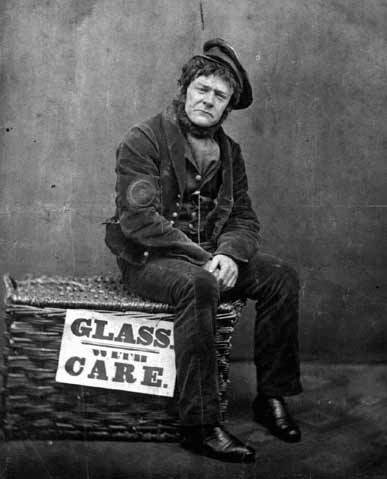 Cowell, over his tragically short life, had an enormous effect as a solo comic performer on people of all classes in both America and the British Isles. He became known as the ultimate Billy Barlow on both sides of the Atlantic. George Coppin might have contested the throne, or taken it over after Cowell’s death, had he not migrated to Australia. As it was, Coppin found himself a vast new kingdom there where he became known as Australia’s main Billy Barlow. I will look again at Sam Cowell further on. There is a quite impressive list of 19th-century comic and serio-comic entertainers who are known to have at least occasionally played Billy, and sung his song, but these are — more than likely — just a few of many. Billy Barlow almost certainly appeared in most of the English taverns at one time or another. The 1850s saw the birth of the music-hall as we think of it today, developing out of these taverns. Billy Barlow was right there in the places where it was all happening. He also appeared in the “legitimate” theatres and on the street, some actors moving between street-theatre and tavern, and some performing in small theatre, tavern, music hall, and “legitimate” theatre. Billy Barlow was certainly an important character at Evans’s Music and Supper Rooms where Sam Cowell became the most popular and most highly paid entertainer. Evans’s had a sign above the door that said “Late Joys”. The place had once been called Joy’s so this was one of the many possible puns on the name Joy. Through the 1840s this was the meeting place of writers, actors, painters, and poets. Charles Dickens was a regular visitor. Ideas were discussed over ale and chops, and characters were born or reborn in the minds of creative men. Some of these characters moved around through literature, poetry, song, and stage routine until it was impossible to trace their origins. Many of them had been around in some form or another for as long as storytellers had existed. Cowell played other famous music-venues in London in the 1840s and 1850s, The Coal Hole and The Cyder Cellars among them. Like a few of the top performers of his time he also appeared in the “legitimate” theatres like Dury Lane, Covent Garden, and Canterbury Hall. In fact, his talents were such that he actually stepped straight into roles in the top theatres when he first came to the British Isles from America, before deciding on a career as a solo performer. The Coal Hole was famous as much for its drunken parties — led by actor Edmund Kean — as for its fine collection of silver drinking-vessels and its clientele of London’s celebrities. For six years until his death in 1827, William Blake had lived just down the road, dreaming about his “mansion elsewhere” and illustrating Dante’s Divine Comedy and The Book of Job. I wonder if he was present at tavern gatherings. At Canterbury Hall in 1854, Sam Cowell was receiving payment of eighty pounds a week at a time when the going rate for singers in song-and-supper rooms was three half-crowns per night and two hot drinks. Payment for the services of Sam Cowell was money well-spent. He was an amazingly energetic performer, with the movements of a dancer and the vocal agility of an American auctioneer. He had the voice of an opera singer and could make himself heard in the largest of theatres. He was a superb actor of comedy and tragedy, and marvelous at the two in combination — the type of actor who was later termed a serio-comic. Above all, he had the aura around him that today would be inadequately described as Presence. Sam Cowell drove himself hard, his wife describing how he would be in a state of collapse when he came off stage, drenched in sweat and pale as death, his cheeks wet with tears. No matter how exhausted he seemed, however, the shouts of “encore!” and the cheers and applause of the audience always drew him back for another curtain call.